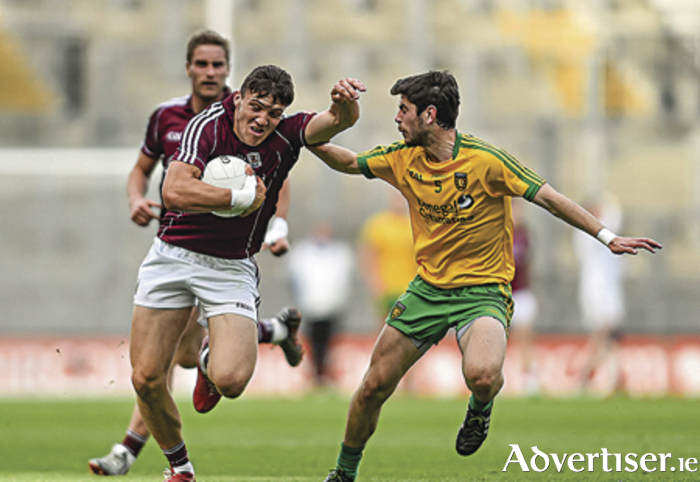 Damien Comer, Galway, in action against Ryan McHugh, Donegal. At half time last Saturday in Croke Park, with the teams level, most Galway supporters were pleased with their team’s work-rate and performance and even twenty minutes into the second half, those of us in the Cusack and Hogan Stands were still hoping that if Galway could get a goal, or pull a few points in front, it would ask serious questions off Rory Gallagher's men. Adrian Varley had a slight chance of a goal with Paul Durcan well off his line, before he took his point and had the Cortoon man raised a green flag it would have been interesting to see how the 2012 All-Ireland champions would have responded. Likewise, if Paul Conroy had scored a handy enough free it would have given Galway some impetus and maybe they could have tacked on another point or two as well. However, instead of that happening, Donegal's leaders such as Neil Gallagher, Odhrán MacNiallais, Colm McFadden, Ryan McHugh and team captain Michael Murphy really ramped up their game and gave Galway a torrid time in the last fifteen minutes. A few things went against Kevin Walsh's men at important stages in that second half and instead of keeping with last year's All-Ireland finalists in the home stretch they found themselves burnt badly in the last ten minutes by two goals and flurry of Donegal points. Considering the effort put in by Galway for the first sixty minutes, it was harsh enough to find themselves 10 points behind - 3-12 to 0-11 when Eddie Kinsella (Laois ) blew up proceedings. The game was in dead time when Christy Toye rocketed his effort past Brian O' Donoghue, however it just emphasised how quickly the top teams will bury you, if you give them any opportunity to do so. And having been outscored 2-8 to 0-4 in the second half, there could be no question as to which team was superior. The debate on the way home was whether there has been progress made over the past year, and I would contend that there has been. Yes, we were beaten in championship by both Mayo and Donegal, however both those teams are in the top four in the country and we realistically would struggle to make the top ten or twelve as evidenced by our longevity in Division Two of the league. That said, the wins over Armagh (away ) and Derry in the championship were good performances and the likes of Cathal Sweeney, Liam Silke and Damien Comer will all have learned from getting a good run of championship games under their belts. There are some obvious problems that need to be rectified if Galway are going to target promotion to Division One next Spring and attempt to stop Mayo going for a six-in-a-row of provincial titles next summer. However, people have to be realistic and ask the question, - are there the players currently in club football in Galway to do either of those two things? No doubt Kevin Walsh and his management team will examine the rest of the club championships at all grades in the county to try and find a few new players to add to the mix for 2016. Guys like Mountbellew's Michael Daly or Headford's Michael Day spring to mind, or a few others from Alan Flynn's U-21 squad, but there are not four or five undiscovered Colm Coopers, David Moran's, Diarmuid Connolly's or Micheal Murphy's lurking around the county to suddenly come in and make it all Hunky-Dory again. We are a long way back from the top teams and the likes of Kerry and Dublin are playing at a different level entirely. There is no quick fix to that fact. Some of the stuff you read on social media and on some of the GAA websites would make you think that if Galway suddenly had a Jim McGuinness, or Jim Gavin, or Eamon Fitzmaurice in charge, things would be miraculously improved - which is complete balderdash. The reality is that managers get too much praise when their team wins, and too much criticism when they lose. It was interesting to read what Cork's John Cleary had to say this week when interviewed about letting his name go forward for the vacant Cork football manager's position. “It’s not that you just take it, and that you’re manager, and everything else falls into place. It is like having a second employment with no pay. It’s not something that you jump lightly into. I’ve been involved in management, had good days and bad days. To me, it’s all about the players. The better players will come out at the end of the day – a manager can only do so much and too much has been talked about what a manager can do for a team. “They can do so much, but the Kerry’s and Dublin’s, you see what they have, the resources they have and the players they have." Ultimately it the players that will always make the real difference between winning and losing. And last Saturday when the game was there to be won, it was Donegal who had the more experienced and superior players in their ranks and that is why they won pulling up. Page generated in 0.1670 seconds.